Wine and pizza. Like bacon and eggs and cookies and cream, some things in life are just meant to be. Although, these days there are just about as many pizza toppings out there as there are wine varieties, and that’s where things can get a little tricky. 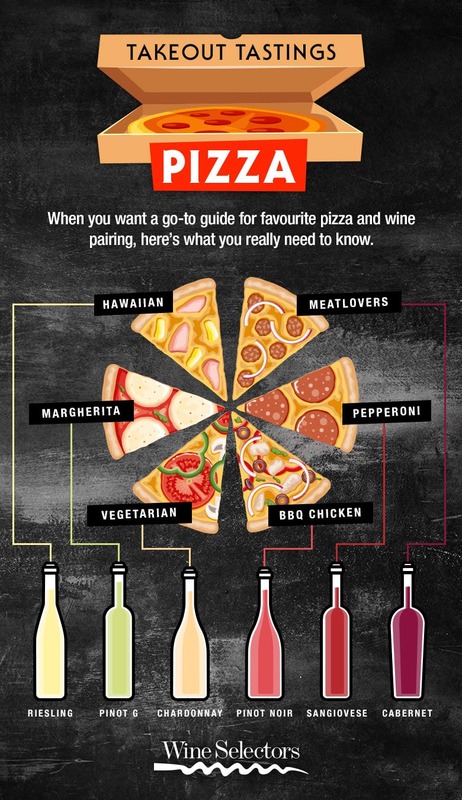 So, to help you find the perfect wine to go with your favourite pizza, we’ve put together this handy little guide. Don’t dial delivery without it! Featuring the simple and classic flavours of tangy tomato, creamy mozzarella and fragrant basil, a margarita pizza lends itself to light/medium-bodied wines. The zesty flavours of a Pinot Grigio are just enough to bring out the pizza’s flavours, without overpowering it. Pair with: Pinot Grigio or Sangiovese, Rosé. Best to avoid: Heavy bold wines such as Cabernet Sauvignon or Shiraz. To balance out the strong spice of pepperoni, opt for a wine with rich, fruity flavours like a Sangiovese. Its savoury qualities and moderate acidity will cut through the pepperoni’s fat and saltiness, providing the perfect moreish match. Pair with or Sangiovese or Barbera, Nero d'Avola, Nebbiolo. Best to avoid: Lighter-style wines such as Rosé. When it comes to pairing wine and Hawaiian pizza, it really is a case of opposites attract. A reasonably sweet Riesling will work beautifully as a counterbalance to the saltiness of the ham, while also enhancing the pineapple’s punch. The high acidity of a Riesling also provides a great palate cleanser to boot. Pair with: Riesling or Prosecco, Sauvignon Blanc, Fiano. Best to avoid: Rich, fruity reds such as Shiraz. With these intense meaty flavours, you’re going to need a wine that’s up to the task and one never-fail variety is Cabernet Sauvignon. Its elevated tannins will match perfectly with the fattiness of the meat and the rich fruity flavours will provide an undeniable flavour combination. Pair with: Cabernet Sauvignon or Tempranillo, Shiraz, Malbec. Best to avoid: White wine. The smokiness and sweetness of the barbeque sauce will pair perfectly with the fruitiness of a Pinot Noir. Its light body and fine tannins will work beautifully with the chicken, without overpowering it. Pair with: Pinot Noir, or Dolcetto, Merlot, Chardonnay, Rosé. Best to avoid: Light-bodied white wines. If you like your vegetables where you can see them on a pizza, think about a wine that’s not going to compete with the mix of components going on in a Vegetarian pizza. An unoaked Chardonnay is a good place to start. With its gentle notes of citrus and herbs, it complements the similar flavours of the vegetables perfectly. Pair with: Chardonnay or Sauvignon Blanc, Prosecco, Fiano, Rosé. Best to avoid: Deep, full-bodied reds like Shiraz, which will overpower the humble veggies.